Philadelphia, Pennsylvania (January 18, 2018) - Janney Montgomery Scott LLC (“Janney”), a leading full-service wealth management, financial services, and investment banking firm headquartered in Philadelphia, PA, is proud to announce that four of its advisor teams have been named as Top Defined Contribution (DC) Advisor Teams by the National Association of Plan Advisors (NAPA). The list recognizes the top financial advisor teams that specialize in serving defined contribution (DC) retirement plans. CSG Capital Partners of Janney Montgomery Scott LLC, located in Washington, D.C., was established in 1998 and consists of Murray Carter, Mitchell Lerner, Erik Fromm, and Chris Rockwell. Together, they have over 70 years of combined experience, successfully managing the retail wealth and retirement plans for individuals, families, trusts, small businesses, and non-profit organizations. Karpiak-Dupée Investment Group of Janney Montgomery Scott LLC is located in Philadelphia, PA and consists of Gregory Dupée and Scott Karpiak, who joined Janney in 2015. The team conducts a broad mix of institutional-level research for clients in the not-for-profit, corporate, and high-net-worth private client segments. Forrester Wealth Advisors of Janney Montgomery Scott LLC, located in Washington, DC, is led by Mary Ann Forrester, who joined Janney in 2001. Having worked extensively with hundreds of clients over the past 25 years, she is experienced at managing the intricacies of investment risk tolerance, time horizon, and client expectations, with a focus on helping her clients create an income stream from their investments during retirement. S.C. Asset Advisors of Janney Montgomery Scott LLC, located in Columbia, SC, has helped individuals protect, manage and grow their retirement related assets since 2003 through multiple market environments. The team is comprised of W.G. Simms Oliphant, Chris Smith, Jane Goodyear, James Owens, and Julie Hall. As a group, they have over 100 years of combined investment experience. Since their inception, NAPA’s various industry lists have been a valuable directory of who matters in the world of retirement plans and retirement plan advisors. 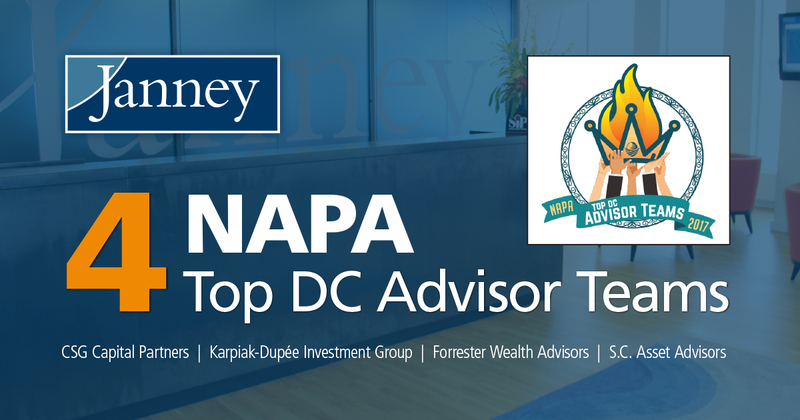 The NAPA Top DC Advisor Teams, ranked by DC assets under advisement, presents a compelling case for the impact on the nation’s private retirement system. The National Association of Plan Advisors, an affiliate organization of the American Retirement Association, was created by and for retirement plan advisors. Membership is also open to other retirement industry professionals who support the interests of plan advisors. For more details about the awardees, visit http://www.napa-net.org/industry-lists/top-dc-advisor-teams-over/.